I’m an absolutely huge classic-Disney fan. Many of my readers probably didn’t know that, given the fact that I take shots at Disney in many of my reviews. It’s true; if you look past the year 1995, Disney has done nothing but terrible films. Their partner, Pixar, has done great animated work, but that’s not Disney. However strong my distaste with modern Disney may be, I’m still a huge fan of their classics. 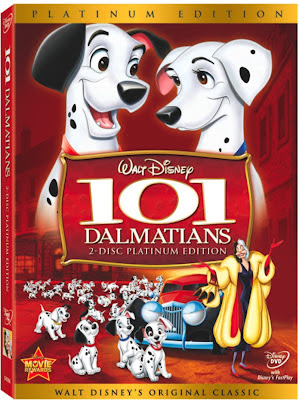 Since 2001, Disney has been periodically releasing their “Platinum Edition” line of DVD’s, which is a line up of the studio’s best animated work. It started with the 2-disc “Snow White” DVD, which remains to this day one of the best packages ever released. Subsequent platinum editions have been less impressive, but still a notch above most DVDs in terms of video quality and extras. I proudly own all of them, but while purchasing the latest entry, 101 Dalmatians, I realized I’ve never reviewed one of them. That had to be fixed. And thankfully, Disney has once again put together an excellent package. 101 Dalmatians was an important film for the studio in 1961. The previous Disney film, Sleeping Beauty, took 4 years to animate and bombed at the box office. The studio was nearly bankrupt, and the 500+ staff was cut to just over 100. From this point on, animation was sketchier and of lower quality—watch Lady and the Tramp or Sleeping Beauty and then watch 101 Dalmatians or Jungle Book, and you’ll know what I mean. But as always, Disney films weren’t about how detailed the art was; it was about a thumping good story, and to try and save the studio, they went for something simple and fun. Thus, 101 Dalmatians was born. The film is one of the most tightly constructed, well paced animated adventures of the era. It’s a perfect example of classic Disney, but at the same time, is different from nearly everything the studio had done so far. The film centers around the Dalmatian Pongo, who, with his ‘pet’ human Roger, meets Perdita and her ‘pet’ Anita. Anita and Roger get married, as do Pongo and Perdita. The dogs soon have 15 puppies, but the villainous Cruella De Vil wants them to make a fur coat. The humans refuse to sell their puppies, so Cruella steals them. It’s a very simple, classic Disney premise. But the execution is flawless. The creativity exhibited here is phenomenal; from the very distinct characters to the fun TV shows they watch to the fun, detailed backgrounds; this is a fun, creative animated feature. It’s well paced and delivers a very rich, entertaining 80 minutes of fun. The animation is, as I mentioned above, less rich and detailed then earlier Disney productions. But that doesn’t mean it’s necessarily worse. No, the animators took the simple methods they had at their disposal and made it work very well in the context of the film. The artwork is simple, but fits the plot very well and is a joy to look at. As always, the dogs move flawlessly, as do the humans. Disney really knew how to animate movement. This is one of the understated, but also one of the best classic-era films. It makes me sad to think of how many great Disney classics there were back in the 30’s-60’s, and now, if Disney puts out one good animated movie in five years it’s a surprise. The film also reminds us of the power of hand-drawn animation. Rougher and less sleek than CGI, it also gives much more life and charm to characters. I miss 2-D animations. Anyway, the point is, this is a classic, and a kids film everyone should watch. On DVD, the film is better than it has ever been before. It’s gone through a pain-staking remastering process, and the results are easily apparent. It’s presented in the original aspect ration of 1.33:1, or fullscreen. As. a result of budget cuts, 60’s Disney films were animated in fullscreen and ‘cropped’ to widescreen for theaters. This is how Disney intended it. Colors simply jump off the screen; each color and shade is bright and vivid, and contrast is as sharp as could be. You can see every single detail in the animation, and there’s not a speck of dirt or grain in the entire film. The remastering is so good, in fact, you can see many of the rough pencil lines in the animation. This is the best DVD video I’ve seen since the last Platinum Edition; these things always have top-notch picture quality. The image looks like it is hi-definition; I’m not joking. Blu-Ray couldn’t improve on this phenomenal image. The perfect video is complemented by a very good audio track. Every bark and sound effect is crisp, as is dialogue. The music comes through clean and clear. All of it sounds a bit aged, as is expected. But it sounds as good as I think it possibly could, and represents the intentions of the creators very well. My single quibble with the presentation of the film is that the DVD creators have removed the original, plain blue Disney logo, and replaced it with the new CGI logo. This really made me mad; for one, I hate this new CGI logo. The blue one sufficed. But putting it in front of classic films? That’s a step too far. Thankfully, it’s the only change; they didn’t edit out Cruella smoking, or anything like that. The extras on this DVD set are the standard stuff we’ve come to expect from Platinum Editions; it’s the same template that was set in place by Bambi a few years ago. You’ve got the Disney Channel Music Video, Making-Of Documentary, Featurette with Walt, Games for the Kids, Deleted Scenes, etc. It’s all pretty good, but the amount of effort doesn’t seem as heavy this time around. Starting on Disc One, we’ve got two pop-up trivia tracks. For the Family and For the Fan both offer 101 facts that pop up during the movie. The family track gives very simple and trivial facts, like the number of spots on the dogs. This is, as the name suggests, something kids and casual fans will enjoy more. The fan track is more informative, but still somewhat trivial. It gives the names of artists who did certain scenes; things like that. Disney Enthusiasts should enjoy it. Disc One also offers a Music Video by some Disney teenybopper star. I don’t remember who it is…because I didn’t watch it. I watched the one on the Cinderella DVD a few years back, and it scarred me for life. Disc Two is where the meat of the extras are. Before I begin to explain them, I have to point out a MAJOR oversight on this disc. The extras on Disc Two are all in Widescreen, which is common because many people own Widescreen displays. But as has become a trend with these Platinum Editions, they are all in non-anamorphic widescreen. For those who don’t know, Anamorphic Widescreen is an image encoded in 16x9; the kind of image that fulls your whole widescreen display automatically. Non-anamorphic means it is encoded in 4x3, with black bars burned in. For widescreen TV owners, this means we have to zoom in to make it fill the screen, and this sacrifices video quality. Some may think that it takes more effort to do an anamorphic image, but this couldn’t more incorrect. The features on this disc feature cropped clips from the film; they also had to shoot the footage in 16x9, and had to crop storyboard sequences down to 16x9 as well. So the image is naturally anamorphic. The DVD creators had to go in and add black bars to make it non-anamorphic. Keep in mind, an anamorphic image will downgrade fine to a 4x3 image on a 4x3 TV. It took extra effort to make this a lower-quality disc. The point of shooting in widescreen, after all, is to be able to show it on a widescreen TV. But if it is non-anamorphic, you must zoom in on a 16x9 TV, and you have black bars on a 4x3 TV. They’ve done this on all the Platinum Editions, and it is getting really, really old. But that quibble aside, this is a pretty good disc. You get three Menus—the first is “Backstage Disney.” In here, we have features about the making of the film. The first is Redefining the Line: The Making of 101 Dalmatians. This is your standard Platinum Edition “making of,” for the most part. It runs 33 minutes, which is shorter than other features on prior Platinum Editions. It packs a lot of good information in; we learn everything there is to know about the animation, as well as the music. But I would have liked to learn more about the history of the project and the impact it had on the Disney studio. These points are barely touched upon. But it’s a good documentary overall, and well worth a watch. The second feature is Cruella De Vil: Drawn to Be Bad. Running 7 minutes, it is aims to educate us about the creation of the character. There’s some cool tidbits here and there, but its mostly just animators gushing about how cool a character she is. This is worth a watch, but it belonged in the documentary. Next is the 12-minute Sincerely Yours, Walt Disney. All the Platinum Editions have strived to have some bonus featuring Walt, and this one is akin to the scrip session feature on the Bambi DVD. It doesn’t actually have Walt, but a voice actor portraying him. The feature uses letters in Walt’s archives from and to Dodie Smith, author of the book the film is based upon. They had a neat correspondence that lasted long after the film. This is a creative featurette, and I enjoyed it for the most part. You don’t learn a lot about the film, but you do gain respect for Walt. My only complaint is that the voice actor for Walt sounds nothing like the real thing; and the live action recreations of the two writing their letters is very cheesy. But overall, this is a fun and insightful bonus. There’s also 17 minutes worth of Trailers and TV spots. There’s a wealth of promos here, with a few from all releases and re-releases of the film. We also get a large amount of radio promo material, which is simple audio that plays on a still screen. I don’t remember the last Platinum Edition with this much trailer material. Rounding off the “Backstage Disney” section is a large art gallery. Back to the main menu, the next option is “Music and More.” Here, we get 6 deleted/extended song sequences. As it turns out, 101 Dalmatians was planned to be much more of a musical. Some of these are storyboard sequences with fully recorded background sound, featuring a text introduction, while some function like a featurette with snippets of whatever was recorded. The section about the Cruella De Vil song is 20 minutes long! Most of this is definitely worth a watch. Finally, there’s the Fun and Games section. There’s a few silly little games here to entertain the kiddies, and it’s nothing of worth to Disney enthusiasts. But kids should have fun with it. I would actually say the extras in this section should be on Disc One; the film barely uses two layers, so there is room to spare without sacrificing video quality. That way, kids have everything they want without changing discs. The extras on this two disc set are not sparse; there are quite a lot of them, really, but I didn’t get the same “oomph” I’ve felt with prior Platinum Editions. The extras could be more informative, and an audio commentary with Disney historians, or voice clips from Walt, would have been nice. But overall, this is a solid extras section that answers many questions about the film. It ranks higher than the Peter Pan and Aladdin Platinum Editions, and is about on par with everything else except Snow White and Beauty and the Beast. Given the strong Extras section, and the unbelievable Video Quality, this is a set I highly recommend. I can’t wait for October’s Platinum Release of Sleeping Beauty; that’s one of the most detailed animated images ever, and if the video quality is half as good as it is on this disc, it will be quite the treat. In the meantime, this is a set you shouldn’t regret picking up!